The Lethbridge Hurricanes flipped the script Saturday at the Centrium. 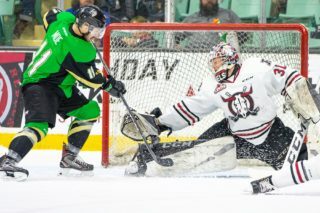 One night after Rebels goalie Ethan Anders made 35 saves in a 3-1 win at Lethbridge, Canes’ netminder Carl Tetachuk turned aside an equal number of shots to backstop his squad to a 2-1 victory before 4,701 fans. “It was obviously a really good hockey game. 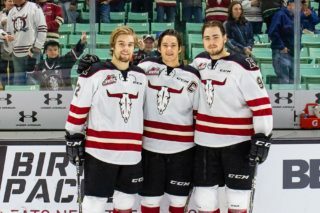 Both goalies were outstanding, both played really well,” said Rebels GM/head coach Brent Sutter, referring also to Anders, who finished with 29 saves. The hosts peppered the Hurricanes rookie netminder with 18 shots in the first 20 minutes, but Tetachuk stood tall, allowing the ‘Canes to gain momentum in the second period. 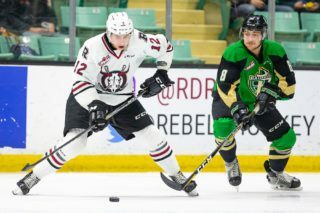 The visitors pulled even at 12:23 of the middle frame on a fluke marker by Jake Leschyshyn, whose soft wrist shot from just inside the Red Deer blueline glanced off a Rebels defender and past Anders. The Canes took advantage of poor defensive play by their Central Division rivals to pot the winner midway through the third period, as Logan Barlage found Jackson Shepard on a two-on-one down low and his teammate notched his third of the season. “Their second goal, it’s a bad mistake by our forwards in the neutral zone,” said Sutter. “We turned the puck over being too cute in the neutral zone, circling back instead of just playing straight lines. The loss, coupled with Medicine Hat’s 5-3 win over Swift Current, dropped Red Deer into fourth place in the division, one point back of both the Hurricanes and Tigers and three behind the front-running Edmonton Oil Kings. 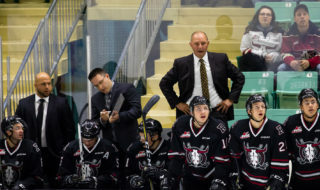 The Rebels, who take on the host Calgary Hitmen — nine points in arrears of Red Deer — Sunday at 4 p.m., have games in hand on each of their divisional playoff teams, including four on Edmonton. “It’s a tough game to lose but we have to reset and get ready for tomorrow,” said Sutter. 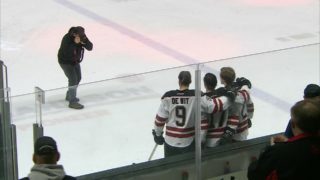 The Rebels lost de Wit to what appears to be an upper-body injury in the second period when the overage forward crashed into the Lethbridge net. “At that point in time both Jeff and Alex (Alexeyev) both went out and then Alex came back,” said Sutter. “Obviously Jeff is a big part of our team. He’s playing with Hages (Brandon Hagel) and he and Hages complement each other so well,” said Sutter. “But you have to keep pushing. We got back to playing pretty good, even in the third. But you have to understand what the score is, you can’t be cute and you have to keep the game simple and play it the right way. Notable: Tetachuk was selected as the game’s first star, with Hagel and Rebels rookie forward Oleg Zaytsev feted as the second and third stars. Hagel had some tough luck, coming up empty on numerous scoring chances, at least two of which found a post . . . Hagel has collected 157 assists during his career with the Rebels, just four back of all-time franchise leader Arron Asham.